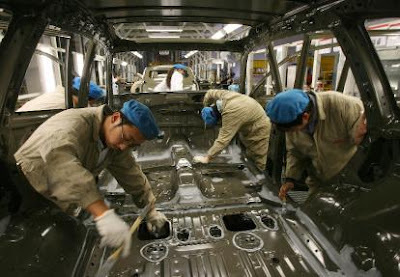 China economy shows strong growth. January 21 2010 : China says its economy expanded by 8.7% in 2009, exceeding even the government's own initial expectations. The pace of change increased as the year went on, with growth in the final quarter of 2009 increasing by 10.7% from the same period a year earlier. China is now on course to overtake Japan and become the world's second-biggest economy. Japan announces its latest GDP figures next month. Its economy is likely to have contracted by about 6% in 2009. China says its economy expanded by 8.7% in 2009, exceeding even the government's own initial expectations. Japan announces its latest GDP figures next month. Its economy is likely to have contracted by about 6% in 2009. He said China had faced "severe difficulties" in 2009, but its economy has now recovered and is moving in the right direction. Annual growth was only slightly down on 2008. But Mr Ma played down speculation that China's economy had now overtaken Japan's. "According to the UN standard - that is $1 a day - there are still 150 million poor people in China. That is China's reality," he said. "So despite the increase in our GDP and economic strength, we still have to recognise that China is still a developing country." These latest GDP figures have exceeded the target set by the Chinese government. This is a turnaround because China, like other countries across the world, was hit by the economic crisis during late 2008 and early 2009. Factories closed and workers were laid off. China's economy recovered with the help of a massive government stimulus package and now there are signs it is expanding too quickly. Inflation is picking up, with Mr Ma saying consumer prices increased by 1.9% in December from a year earlier. "It reminds us to be fully aware of following the trend of price changes," he said at a press conference to announce the economic data. Mr Ma said price rises were "mild and under control", but over recent days the government has tried to limit the amount of loans made by the country's banks. However, some economists have questioned the reliability of China's economic data, with some accusing the government of overstating economic growth for political reasons. Meanwhile, the World Bank has said that the global economic recovery will slow later this year as the impact of government stimulus policies wanes. The Bank has forecast growth of 2.7% this year after a contraction in 2009. However, its predictions for Japan are slightly less pessimistic than other forecasters. It estimates that Japan's economy shrunk by 5.4% last year. It added that the poorest countries - those that rely on grants or subsidised lending - may require an additional $35bn to $50bn in funding just to sustain pre-crisis social programmes. China is expected to become the world's biggest economy in 2030. We encourage people to contact us with any comments regarding news or any other queries about this site. We will respond you respectively and promptly. We are going to moderate comments only to avoid unwanted and spam messages. Thanks for your interest ! ! ! ! ! ! ! World News Updates: Powerful Earth quake and Tsunami in Japan video. Tsunami warnings were issued Friday for at least 20 countries and numerous Pacific islands, including Japan, coastal Russia and the Marcus Islands, the Northern Marianas, Wake Island, Taiwan and Guam. Japan News Updates: Japan nuclear emergency: Live updates. In view of apprehensions about the safety of nuclear installations in earthquake-hit Japan, former Chairman of the Atomic Energy Commission (AEC) Anil Kakodkar today said Indian nuclear reactors were safe. Le plus gros tremblement de terre a frappé le Japon en 140 ans a frappé la côte nord-est le vendredi, déclenchant un tsunami de 10 mètres qui a balayé tout sur son passage, y compris des maisons, des voitures et des bâtiments de ferme sur le feu. Bollywood News Updates: Shahid Kapoor and Priyanka Chopra finally calls it quit. Shahid Kapoor and Priyanka Chopra always hit the headlines for their off and on relationship but this time, the grip of their separation is very tight and there seems no room of reconciliation. .